512p. Freeform. Feb. 2018. Tr $17.99. ISBN 9781484728499. POPGr 8 Up—When the Goddess paid more attention to her children, the humans, the God of the Sky became jealous and cursed them to have skin of colorless sky. Never one to abandon her children, Beauty created The Belles to bring beauty back to the damned. Camillia Beauregard and her sisters are Belles, vessels of beauty, and their time has come to save Orleans from a life of unbearable sameness, but they must first be placed in houses. The coveted position is The Favorite, and to serve the royal family. Camillia desires to be chosen Favorite like her mother and when her time comes to shine, she is unforgettable. Sophia the Queen Regent does not forget her. 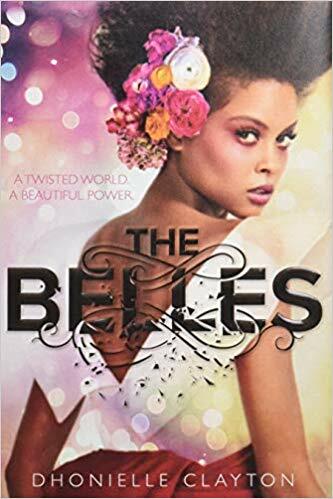 As Camillia begins her life of royal servitude, she starts to see the underbelly of her world—mysterious cries within the walls, veiled Belles of a time passed, and people who risk their lives to be beautiful. The grandest realization is the volatile temperament of Sophia. Camillia must make a choice—be the vessel of beauty and follow every command or use her powers to save her world from Sophia. Clayton has created a world full of lush colors, beautiful people, and delicious desserts. Strong themes are interwoven in this fantasy, including choice and envy. This work challenges readers to reflect on their notions of beauty. Through the actions of the characters, teens will understand what a beauty-obsessed world really looks like and that possessing conviction and selflessness is just as beautiful as outward appearances. VERDICT A must-have addition to libraries with fans of The Selection by Kiera Cass.